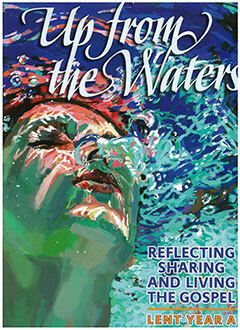 New program: Eileen Burkett, Fr Peter Brannelly, Elizabeth Harrington and Marist Brother Roger Burke with the Up from the Waters – Reflecting, Sharing and Living the Gospel resource. MARIST Brother Roger Burke’s enthusiasm for spreading the Good News of Jesus Christ is infectious. In more than 60 years as a Marist Brother he has strived to live the Gospel and has always encouraged others to live out their baptismal call. In Jubilee parish, in Brisbane’s inner west, he has been instrumental in adult faith initiatives including the annual Lenten program. With his characteristic fervour this has resulted in more than 100 participants in Lenten groups throughout the parish every year. 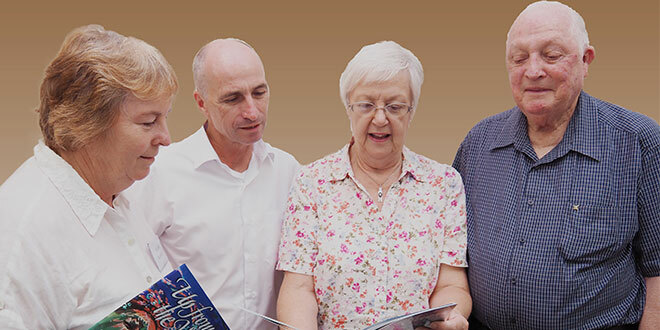 This year, however, Br Burke is keen to reach a greater number of parishioners with the Brisbane resource Up from the Waters – Reflecting, Sharing and Living the Gospel. Last week the group leaders gathered in the parish centre for an overview of the program from the editor, Evangelisation Brisbane project officer Rob Cosgrove and Liturgy Brisbane education officer Elizabeth Harrington. Parish priest Fr Peter Brannelly spoke about ways the parish would promote the program through the newsletter, speakers at the end of Mass, PowerPoint slides before Mass and by personal invitation. Fr Brannelly thanked the leaders for their service of ministry to the parish. Mr Cosgrove spoke about the vision behind the title, the cover art and the two “lenses” for the season of Lent –penance and baptism. “The Second Vatican Council stressed both. The season of Lent had its origins in the early Church as the catechumens were preparing for initiation at the Easter Vigil,” he said. The Sunday Gospel this year includes three texts from the Gospel of John that were of great significance in the early Church as formation for the catechumens – the Samaritan woman at the well; the healing of the blind man; and the raising of Lazarus. For 2017 the Gospel reflections were written by Bunbury diocese vicar general Fr Tony Chiera and Sydney ACU Centre for Liturgy assistant director Dr Jason McFarland. The opening and closing prayers have been prepared by local musician and liturgist Erica Marshall. Mrs Harrington stressed the significance of the personal stories, Good News People (DVD and CDs), that were an essential element of the program. “While each story is unique we can all relate to the events and experiences of these six individuals,” she said. The artwork for each Gospel was completed by Sister Orsolya Fecske. Sr Fecske is a member of the Sisters of Social Service, founded in Hungary in 1923. In the Second World War the order was instrumental in providing sanctuary and safety to thousands of Jewish refugees. Sr Fecske lives in Budapest, Hungary, in a community of sisters who survived repression for many years under the Communist government. “I realise that many people live very busy lives,” Mr Cosgrove said at the training night. With this in mind the program is offered in a variety of modes – book, DVD, CDs, prayer cards and website. All the personal stories and Gospel reflections will be available on the www.lentprogram.com website. “You will be able to watch these videos on your phone or iPad on the train to work,” Mr Cosgrove said. More than 9000 books have been sent to parishes across Australia, New Zealand, Ireland and to many parishes in the United States. Books, DVDs, CDs, prayer cards and posters are available from Evangelisation Brisbane and bookshops around Australia.